The east side of 24th Street is usually crowded with mothers buying fresh produce from Mexican grocery stores, and old men smoking on the steps. 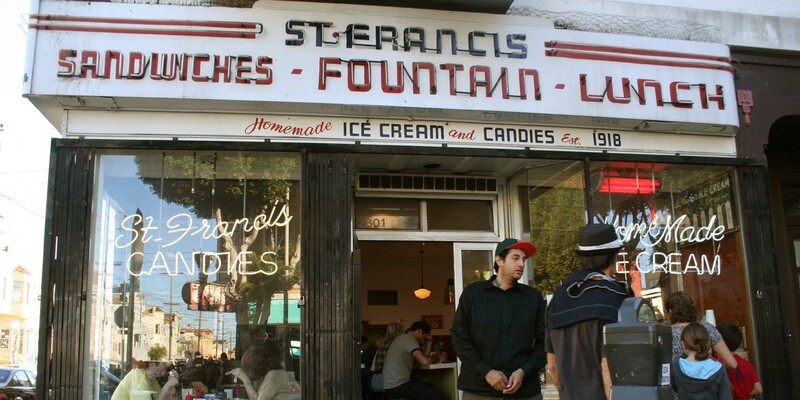 But most weekend afternoons, a throng of hipsters waiting to get into St. Francis Fountain joins the scene. The corner of 24th and York streets is one where history meets 2009. It’s an example of how the older population of Irish, Italian and German immigrants became Latino, and how the old melds with the Mission’s younger, hipper, newer residents. Change. It’s something residents in the Mission District are once again considering as Valencia Street debates the good and bad of American Apparel moving in. Lavon Kazarian knows that debate well. When he bought St. Francis Fountain in 2002, locals hated the idea of a landmark being turned over to an outsider. “They thought we were going to destroy it,” Kazarian said. “People were writing notes saying ‘Please do not go away.’” He said the front window of the diner was covered with the notes when he purchased it. The diner has a long history. James Christakes, a Greek immigrant, founded it in 1918, the same year World War I ended. The family kept it, serving homemade ice cream, chocolate and other sweets until 2000. That year, Ramon Mondrigal bought it and ran the soda fountain for two years, but then became too busy with a printing business. At that point, Kazarian and his business partner Peter Hood, who worked at the breakfast place Boogaloos on Valencia, saw it vacant. The two were friends from their high school days in Sacramento, and immediately looked into leasing the building. The 42-year-old said he knew the restaurant’s history well. He knew, for example, that the Morabito brothers who owned a lumberyard nearby often lunched at St. Francis and, as legend goes, hatched the idea there in the late 1940s to buy the franchise for the Forty-Niners. The changes Kazarian and Hood ended up making were small. They repainted the walls white from bright pink, and built a full kitchen in an area once used for storage. The menu went from the offerings of a soda fountain—floats, sandwiches and omelets—to a full menu for breakfast and lunch. But much of the aesthetic of the old place remains. The candy case where the owners once sold their chocolate has been filled with old-fashioned bubble gum. Pictures of the old days hang in the front window, and the original 49ers sandwich—egg salad, bacon, lettuce, tomato and mayo—is still on the menu. Some old-timers still miss the diner’s earlier days. “They do not make their own candy and ice cream any more,” said Bill Nizuk, a regular who runs a TV repair store down the block. Kazarian said that when they bought the business, the ice cream maker, which produced St. Francis’ signature ice cream, was broken. Instead of fixing it they decided to buy ice cream from Mitchell’s, an ice creamery based in San Francisco for more than 50 years. To pay respect to that past, Madrigal’s wife Regina runs a lingerie store called the Candy Kitchen Lingerie Boutique in the part of the Fountain where sugar and cream once turned into ice cream and brittle. “A lot of the neighbors said I should keep the name on the sign,” said Regina Madrigal. So she repainted it and rehung it out front. A bigger change came with the Mission’s newer residents. “It was very much middle-aged and older white people, and now it’s sort of a young spot,” said Peter Delacorte, a writer based in San Francisco who used to lunch at the old soda fountain in 1970s. Still, Delacorte is happy it’s still there at all. “I think it’s wonderful, that you can keep something like this. It’s very unusual,” he said. The so-called hipster clients who wait outside on weekends say they are unfamiliar with the diner’s past. “But I love the food. It’s so hard to find a good diner in the Mission,” said Luke Ramoce, a thirty-something who works and lives in the neighborhood. Others appreciate the updated menu. “I’m a vegan, and a vegan dish is something you do not expect in American diners,” said Ben Kruer, a waiter at St. Francis Fountain. For Jennifer Baghern, the draw is simple. “The food is classic, and I like the way they kept the place old-fashion,” she said, sipping a strawberry shake with whipped cream. Others like the diversity of the neighborhood. “I like restaurants with character in different neighborhoods,” said Lisa Blades, a personal assistant who lives in the Mission. Blades, who eats at the diner once a month, thinks that unlike other gentrification in the Mission, the diner is in harmony with the neighborhood. “Gentrification is good in some aspects, but it takes away a lot of character. But this place still has a balance,” she said. Kazarian said preserving the place ultimately became more important than who would own it. “A lot of people have memories in this place. So it was nice to keep it open and preserve and fix it up and make a nice place that people want to go to again,” he said.